A formal exit management process mitigates security and legal threats. According to a survey by TEKsystems, only 14 percent of IT leaders strongly agree their organization has an effective employee offboarding process. Employee offboarding process is often overlooked, thus restricting an honest feedback from the exiting employees that can be used for exit analysis. Whether your employee has resigned, retired or terminated, the required paperwork and formalities need to go through a systematic process. Exit interview, clearance from various departments, replacement of the departing employee, full and final of employee dues and more – HR has a lot on the plate during employee offboarding. Organizations are equipped with systematic workflows and tools to hire or onboard new hires, evaluate employee performance, identify top performers, etc. But they struggle to conduct a flawless employee offboarding process. So, how can an organization make Employee Offboarding a good experience for the exiting employees? Is there a way to minimize attrition by making Exit Management more systematic and empathic? Are you tracking Employee Exit Reasons, and can HR do something using this data? Right from the acceptance of employee resignation to approval by the manager and full & final payment by HR – automation helps in speeding up the exit management process and makes it more transparent and efficient. With an automated tool, the entire exit workflow can be carried out in just few steps. Various approvals are needed from finance, IT, HR and other departments to complete the entire exit process. Add significant value to the process by customizing the entire workflow to streamline approvals and complete clearance procedure. With an automated exit management software, managers can capture resignations online and HR can professionally manage the exit process by performing key tasks in a timely manner. » Discuss remaining project work and its due date before employee’s last day. » Prepare a SOP (standard operating procedure) to set up responsibilities for the next person in role and help him/ her exceed in the position. » Plan for Knowledge Transfer (KT) to the replaced employee. » Settle expenses and reimbursements for the individual. » Return company issued access card, laptops, mobile phone, keys, etc. 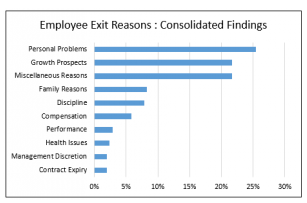 In one of our previous articles, several reasons have been mentioned for an employee’s exit after analyzing 50k+ records (see the image below). The aim is to identify exit reasons with an intent to make the exit process smooth and less traumatizing for the employee. Attrition cost up to 2.5 times the salary of an employee which becomes a major reason for financial loss, especially for organizations with high employee turnover rate. Image: The dashboard shows exit reasons with number of exited employees for each department. With an effective exit management tool, you can run analytics, analyze exit data & reasons and make a suitable action plan to ensure a satisfactory experience for all stakeholders. 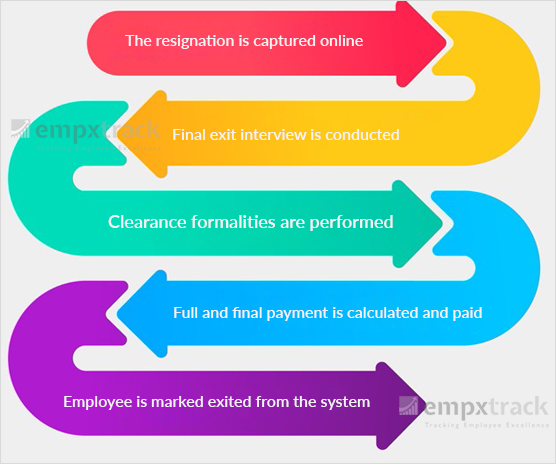 Empxtrack has a comprehensive exit management tool with resignation workflows, knowledge transfer workflows, exit checklist workflows and online exit interviews. It also has an exit survey form that can be invoked by HR and sent to the departing employee for gaining more insights. Employee offboarding isn’t a permanent goodbye. Make sure to treat the exiting employee well with gratitude and leave an unforgettable milestone in their professional voyage. Try out the best exit management practices to end an employee’s journey with your organization on a good note.